UBC has permanently retired Connect. For more information about Canvas, please visit UBC’s Canvas website. The Learning Technology Environment (LTE) Renewal project has resulted in the replacement of Connect with our new online learning platform: Canvas. The project entailed 1) consultation with UBC faculty and students to determine the community’s requirements for UBC’s new platform, 2) a detailed evaluation of two possible replacement systems, and 3) the implementation of Canvas. On this section of the LT Hub website, you can read the LTE Renewal team’s project updates, view the project timeline, and contact the project team. In the 2016/17 academic year, the LTE Renewal team consulted university-wide to better understand how UBC’s learning technology environment could best support teaching and learning. 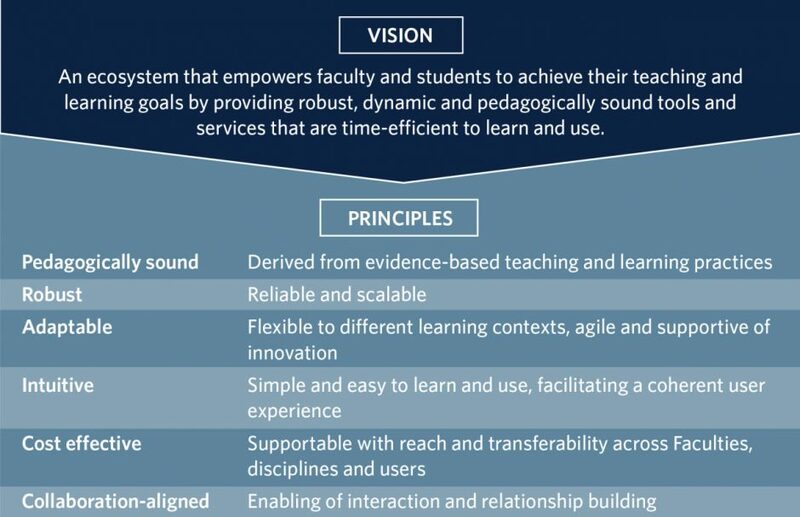 These efforts have been driven by the vision and principles stated in the Learning Technology Ecosystem project [PDF]. In order to achieve this vision, UBC’s priorities for the new system were collected, analyzed, and articulated during the needs assessment phase of this project. These priorities were then used to assess two different learning management systems during the evaluation phase. During the needs assessment phase of the project, faculty and students engaged with their peers and facilitated discussions on the future of learning at UBC. Information from this phase was used to inform the Request for Qualifications (RFQ), which resulted in the selection of two vendors to participate in the evaluation phase: Canvas by Instructure and Brightspace by Desire2Learn. In phase two, the evaluation phase, both systems were evaluated by faculty, staff, and students through pilot courses and sandbox/usability testing. Information from the evaluation phase was compared with data from the needs assessment phase, informing UBC’s decision to select Canvas as the replacement for Connect. emphasizes teaching and learning over the technology that delivers it. was selected as the clear result of faculty members’ and students’ consultations with their peers. puts the needs of faculty and students first.